What about speed? Google Now is so much faster. Yes, but only Google Now will tell you how to talk to a girl, and then tell advertisers that you are dateless and have low self-esteem. Google now and Google voice search are different things. Munster proves what an idiot he is once again. Actually Google Now is slower and is not the same thing as Siri. Piper Jaffray's report cards are pretty generous. I think an outcome like "correctly completed request" would shed more light on the actual experience of interacting with SIRI. As a novelty, it can be fun to play with, but in terms of clutch performance - like responding to a text on the go - it gets an F.
Google now and Google voice search are different things. That's what I was going to post. Google Now is the preemptive data service. 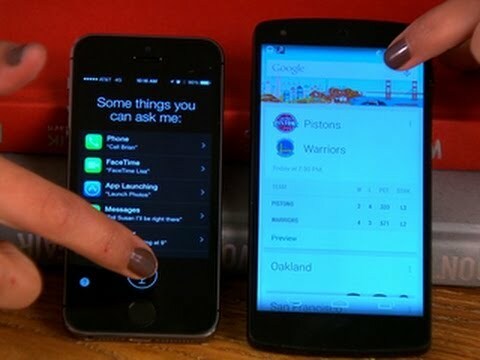 Siri vs. Now is one thing. So either Google's not all they're cracked up to be or (unlikely) they intentionally make their voice tech fail in their iOS apps. I haven't tested the Android versions. But two heads are better than one! The most common use I have for Siri: hold phone to my eat and say "Google search ___________." Great time saver! As for me... I would like Siri to do simple phone task oriented items like - "Play Bach Brandenberg Concerto" etc be performed local and not require a server. Of has that changed recently? That's not my experience at all. Siri's achilles heal is its speed. It's just not noticeably slower than Google Now but slow enough to be annoyance to use. Also, when it can't connect and tells you try back later the message way too verbose since one is likely to want to repeat the request immediately. Finally, if you disable Siri it will default to the old voice commands which are all local. This should be what happens when it detects it can't connect instead of telling me it can't do something as basic and dialing a contact or adjusting a setting. I don't have that problem. Siri is much better for me since iOS 7 came out. Siri looks like it wins in the first round, pretty much tie in the second and clearly loses the 3rd, although all three are fast enough. The problem with the 3rd round for Siri is that it doesn't list a map, but this is handy when you're driving as it can tell you how far it is away and if that sounds good; providing you preface your question with "Find me directions to..". The fourth test is useless because she states Siri had two phone numbers for the contact but doesn't say Google Now had two numbers. If it did, why did it assume they wanted that number? Test 6 with setting up an appointment Siri is fast but she has two emails for the contract which she then has to choose which also makes that test useless without additional information. If Google Now contacts lets you setup a primary so that it won't ask you which number or email or address to use unless you specify otherwise then it's a better system, but this doesn't indicate either way. On test 7,on setting up the reminder for milk, has the opposite issue where Google Now wants you to set which place to save the reminder. Can this setup so it saves it one place? If so, then it's a wash as both are fast, if not, then Siri wins. On the 8th test Google Now wins on playing the song but, again, I want to know if the device was pulling from iTunes Match which then means polling the server to stream the music or if it was local. I assume it was local but I also did a anecdotal test where my local music played faster than in the video but slower than in the video when it was pulling from iTunes server via iTM. Chrome definitely opened faster on Siri, which is surprising, but I find iOS's need to show you the Home Screen janky compared to the visuals provided by Google Now as it opened the app even though Now was slower. On the 10th test they both set up the email quickly and without issue but Google Now edged out Siri in speed, but not enough that Siri would feel slow. On the 11th test, setting up a timed reminder, they both were fast, but again Now edged out Siri but not to any great degree like we saw when Now was first introduced. What I don't get is why this reminder in Now doesn't have an option to where it gets saved to. With test 4 I am not sure who wins. I like the map overview before it zooms in on Apple Maps but I'm not sure if that's a feature or a way of hiding that it doesn't have the micro map location downloaded; or perhaps Google Maps doesn't have the macro location loaded. There is also the issue with each map telling you to go a different way? Which way is more correct? In conclusion, that showed me that Siri, at least in this series of tests, has become much faster or that Google Now has become slower. PS: I really hate that when I use Apple Maps to say "Get me directions to a gas station along route." it will often find me ones in the opposite direction of travel. I'm usually on the highway when I use this feature and I don't want to turn backtrack to get gas. I'd expect that at the very least if I already have a destination set it should look for something ahead of me, but even if I didn't have a destination in maps it should know my direction of travel when in motion. Watch the video dasanman69 provided. I'd say it's just as robust as Siri although not sure about being able to buy movie tickets. I find Siri does have one major shortcoming compared to Google Now in terms to utility. If it's something that requires a browser you have to then access the Safari browser proper to read the page which means that you likely have to then unlock your device. With Google Now it will display the web contents of the search with considerably less rigamarole. The problem with the test is that it's done on 2 different devices. I'd like to see a test done on 2 same model iPhones. Regardless of which one is 'better' they're both pretty darn good and offer us a feature that we only dreamt about a few short years ago. And the chick doing it is hot. 1. Google was quick to see an important Apple innovation and move in that direction. Have they achieved parity? Don't know, since I've never used Google Now. But once again, Google is having to follow where Apple is leading. The same will be true of the fingerprint sensor and the 64-bit microprocessor. 2. I am curious about what version of Android is required for Google Now to work, and what devices it's limited to. My guess is that there are far more Siri-capable devices in the wild than Google Now-capable devices, and that a larger percentage of capable Apple devices, versus Android devices, are used actively. Google Now requires 4.1+ and Siri was first available on the iPhone 4S. Last numbers I could find with a quick search was that Jellybean (4.1-4.3) was on roughly 50% of Android phones, so I'd say that you are correct. It's funny, every part of Siri was already available to Google from their previous experiments with GOOG-411 and other search endeavors but they did nothing to homogenize it into a viable, modern product until after Apple released Siri. It's also why they were able to make it so good so quickly, but how many of these monkey-see-monkey-do scenarios are available to them? Are they designing their own chipset now? The Nexus 5 is the phone I'd buy if I had to choose an Android-based device (although a big part of that is because of the OS update cycle is better and crapware is less) but I see no evidence of them moving to chip design at this point.